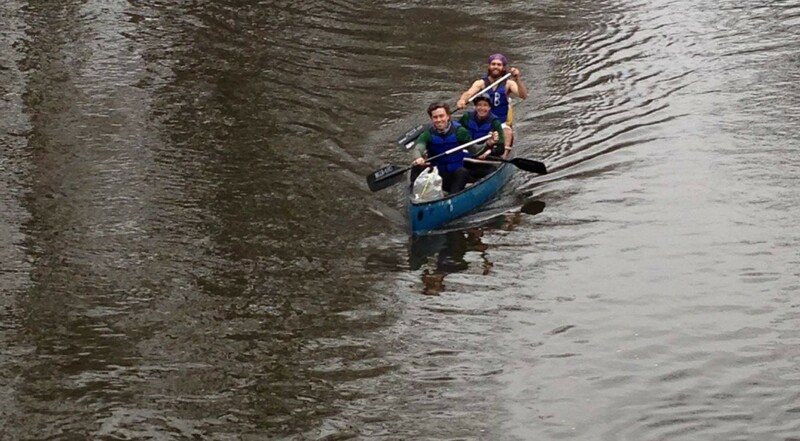 Campus to Coast – a 160 mile canoe adventure race from Michigan State University’s campus in East Lansing, following the Red Cedar and the Grand River all the way to Grand Haven, on the coast of Lake Michigan. 58 hours time, the race’s motto: Eat, sleep (crossed out), paddle. Sounds horrible? Yes. Maybe. Sounds awesome? Yes. Maybe. My feelings about this race were as mixed as this. One second I couldn’t wait for the race to start and in the next second I remembered that I had actually never really paddled in a canoe before. So, maybe a bad idea? Considering the fact that April in Michigan is not the same as April in Germany, the race is to be taken seriously. The water is still extremely cold from winter and temperatures can fall below freezing point during the night. Whoever has tipped in a canoe or kayak before, knows that it is not fun. Well, I haven’t. So I didn’t really know what I had put myself into. outdoor adventurers, so we knew how to plan our food and what kind of equipment we would need. In January we had participated in a 48h orienteering race together, so we also knew what sleep deprivation and cold temperatures feel like. However, the three of us are more the hiking-type. Neither of us had ever spent such a long time in a canoe before. Or paddled at night. Or in my case: paddled at all. places. We just wanted to finish. 7.25am, we’re finally on the river. Starting paddling felt good, my nervousness faded away and I was looking forward to the next two days and nights being spent on the river, seeing Michigan from a completely new perspective. 7.40am. “Jud, my arms start hurting. Is my form correct?“ My thoughts: How will I ever survive this when my arms already start aching 15 minutes into the race. Apparently, I’ll get used to it. According to Jud (who had done a practice trip the weekend before), my body would get used to the unusual movement. The pain won’t go away, but I wouldn’t care anymore. All right, 58 hours of pain were ahead me. 10.20am. We arrive at our first of seven dams. Campus to Coast is not only about paddling – no, you also get to carry your canoe (quite a bit). And who could have known how heavy this canoe would be. Well, I should have left some of my extra clothes and food at home. But no, bad idea, I’ll eventually need it. At some point. We forgot (or purposely) to check the time for the remaining 50+ hours. It didn’t really matter what time it was. Does it actually ever matter? Why do we live our lives after the time the watch on our wrist tells us? Wouldn’t it be better to just live? Over the course of the next hours (maaaany of them! ), we got exhausted, hungry, tired. And that’s where the fun adventure turned into a physical and especially mental challenge. Instead of taking long breaks for sleeping, we always had one person napping in the middle of the canoe while the two others were constantly paddling. Well, not constantly. We still had portages to pass where we often lost quite a bit of time. When you’re tired this sitting down “for just a minute“ easily turns into many minutes. But since we didn’t look at a watch and also didn’t compete for the first places, we didn’t care too much about it. Paddling through the night is an experience in itself. Especially considering the fact, that neither of us had much paddling experience at all. After having had a Redbull, we started singing together, telling each other stories and fought against the exhaustion and tiredness. I realized how incredible it actually is, to be paddling on a river in the middle of Michigan, surrounded by nothing but darkness. Dark water around you, dark skies above you, shadows of trees at the shore and the continuous and monotonous sound of paddling strokes. It was a surreal experience. – when you spend 50+ hours with the same two friends in a canoe, being tired, exhausted, hungry – you might and probably will get mad at each other for the smallest reasons. But once you finish the race together, once you cross the finish line and paddle around the lighthouse in Lake Michigan, all of this is forgotten and you’re better friends than ever before. – your body can do much more than you think it can do. The first half hour of paddling felt horrible. But 49 hours later, we were still paddling and made it to the coast of Lake Michigan. Also, what is 50 hours of pain compared to the 700,000 hours you have on this beautiful planet? – when having paddled for over 30 hours without real sleep, a Redbull gives you wings. Literally. make it easy, but easier. – if you go through an experience like this with your friends, they will stay your friends for the rest of your life. – if you ever get the chance to participate in any such race – DO IT. And this is all I have to say.